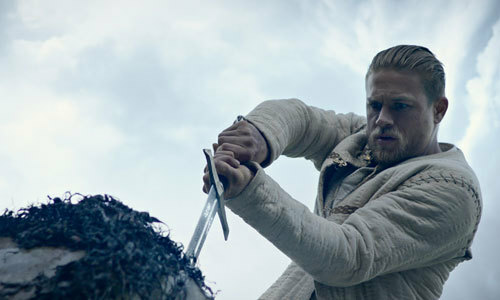 Hunky actor Charlie Hunnam is a sword fighting dynamo in King Arthur: Legend of the Sword, a cool, action-packed adaptation of the King Arthur legends about a young man growing up on the streets who was the only person who could draw the magical sword Excalibur from a stone in order to claim his rightful place as King of England. 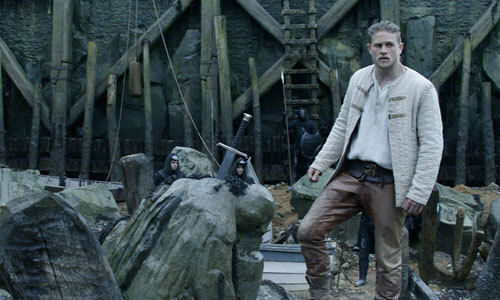 Arthur (Charlie) pulls Excalibur from the stone Courtesy of Warner Bros. 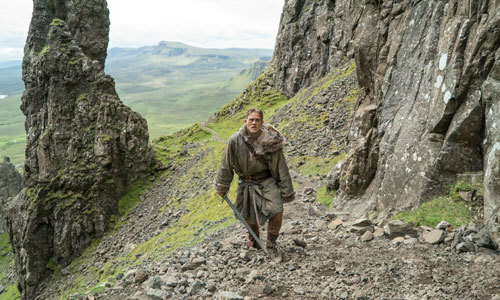 In this interview Charlie talks about how, as a kid, he learned about King Arthur, how hard he worked to get enough stamina for endless sword fighting scenes in the film and how, although born in England, he had to re-learn how to speak with just the right English dialect. Check it out! Q: Charlie, what attracted you to this role? Charlie: It was two-fold. I had grown up with the Arthurian legends and, at a point in my life where (I started to think) that I wanted to become an actor, John Boorman’s movie Excalibur was one of the films that I found myself watching over and over again. It was a film that I really studied and it captured my imagination. I’m talking about very young, six, seven, eight when you realize that there is more than just watching the story play out, that there is an actual process behind it. It formed my playtime as well. I’d play Arthur and Merlin and try to get my brother to engage me in sword fights. Then I’ve also been a huge fan of (director) Guy Ritchie my whole adult life so the two of those things together just seemed very, very exciting to me. On the way to challenge the false king Courtesy of Warner Bros.
Q: How would you describe this version of the Arthur legend? 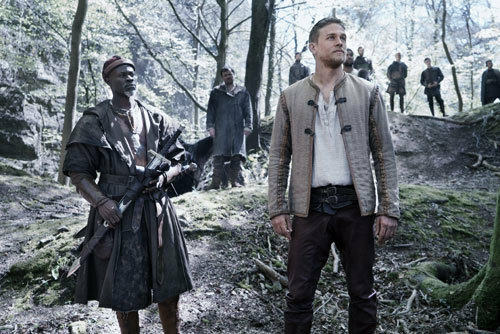 Charlie: I would say it’s a young, cool, irreverent, rock n’ roll rendition of the Arthurian legend. There is a lot of banter and fun but, at the center of it, (it’s) exploring the myths we tell ourselves and how we define ourselves as human beings. That’s a big part of the first part of the Arthurian legend. It’s really about a man ascending to his greatest potential. In order to do that you have to look inside and deal with all of your personal demons and the voices in your head that tell you you are inadequate or incapable of pulling the sword from the stone as it were. So, really the biggest villain or biggest challenge that Arthur faces is quieting his own sense of inadequacy which is something we can all relate to. 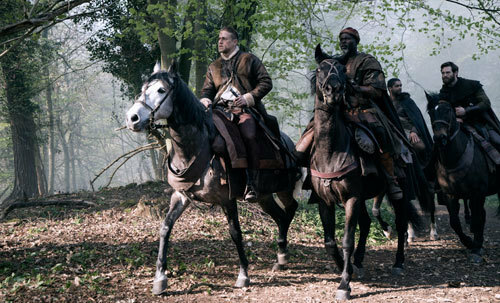 Arthur gathers his followers Courtesy of Warner Bros.
Q: For sure. There is a lot of action and physical stuff in the film. How did you prepare for that? Charlie: I knew there were going to be some very long days. I’ve been on sets doing physical stuff before and know how grueling it is and was able to predict what that was going to require of me so more than any sword fighting or technical skill, just getting my fitness, stamina and endurance level up (was needed). 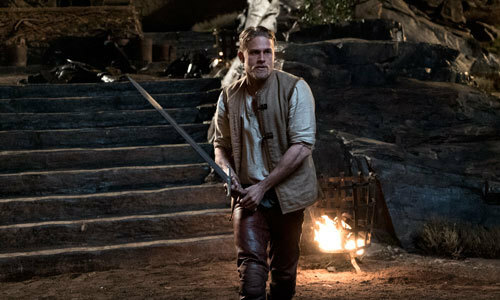 Charlie had to spend many hours swordfighting as Arthur Courtesy of Warner Bros.
Q: Weren’t you already in good shape? Charlie: I like to think I was basically a professional athlete level of fitness because I had to sword fight for 14 hours a day for 5 days in a row. Anybody who has been in a boxing gym or sparred and knows how humbling throwing punches is and how quickly you tire. It’s really the same thing in sword fighting so, to do that for sixty or seventy hours a week, is a really tall order so I did an enormous amount of cardio to get myself to that fitness level. Some fights are with fists, not swords Courtesy of Warner Bros.
Q: Arthur uses a certain English dialect. How did you accomplish that? Charlie: I’ve been in America for so long and acting with American dialects and put an enormous amount of time and energy into learning an American dialect to get it as flawless as I could that, by the time I got hired to return back to England, I had adopted just naturally those cadences and inflection. Q: You were talking quite a lot like an American? Charlie: Yes, so I hired a dialect coach to help me get back into the right rhythm of British speech. But, also, I’m from the North and this takes place in London in the South and those are very different dialects. So, even the English that remained in my dialect wasn’t appropriate for this. So, I had to work hard. Arthur isn't sure of his destiny Courtesy of Warner Bros.
Q: There are huge practical sets in this. How did that add to your experience? Charlie: It’s very exciting and there is an element of it that makes it easier to suspend disbelief, to project into that environment. It helps a lot with that but it also made me feel a level of responsibility that so much money and time and love and expertise had been put into creating those. Q: So most of what we will see in the film was actually there on set for you? Charlie: There was almost no green screen work. Everything was actually practically built at an enormous labor and monetary cost. So to show up and realize (all that) had been put into an environment for us to go and act in, gave us a sense of responsibility to honor all of that hard work and do our very best work. It brings into clearer focus how lucky we are to be there. 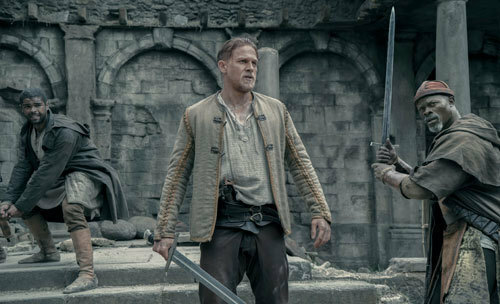 Trying to learn his true destiny Courtesy of Warner Bros.
Q: What do you hope audiences take away from seeing King Arthur: Legend of the Sword? Charlie: First and foremost I think the film is a wonderful way to take a vacation from the stresses of daily life and I think it’s a really fun, visceral, engaging film. Really, at its heart just a great two hours of entertainment. Q: Does it have a message? Charlie: At the center of it I think there is a really beautiful message which is anybody is capable of achieving anything if you are willing to do the work and look inside and explore our own sense of inadequacy and where that comes from and realize it’s all just an illusion; something we tell ourselves and the collateral damage of the failures we’ve endured in our lives. We tend to build up walls and define ourselves by what we’re capable of and what we’re not. It’s all an illusion because anybody is capable of anything. You just have to cultivate that sense of self-belief and march confidently in the direction of your dreams. The throne is worth fighting for Courtesy of Warner Bros.
Q: That seems to especially apply to kids today. Charlie: I think the youth of today has felt a bit disillusioned and I understand it. There’s just not as much opportunity as there used to be even when I was a kid. My little brother just graduated from university three years ago. He’s a brilliant kid and graduated top of his class and got a degree in Genetics. I called him and said “Congratulations” and he said “Yeah, now maybe I can get a job at McDonald’s”. That’s the reality of being a kid these days but, again, identify what your intention is for life and go about it with everything you have because if you march in the direction of your dreams and endeavor to live the life you’ve imagined, you will meet with success. 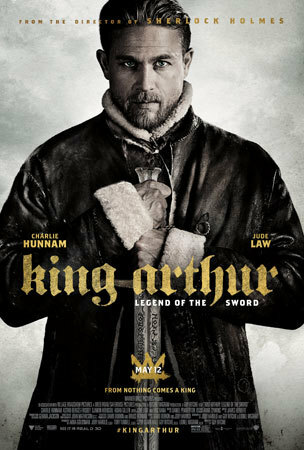 King Arthur: Legend of the Sword Poster Courtesy of Warner Bros.
See King Arthur: The Legend of the Sword in theaters now! Are you into knights and swordplay action? Are you ready to follow your dreams to success? Lay down a comment below. Which movie monster is the villain of Friday the 13th?